Get 2019 organised at a glance with this totally free 1 page printable 2019 calendar as a special treat! 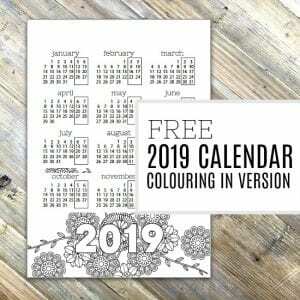 Available in 2 different versions (colouring in AND plain), this 2019 calendar can be printed out as many times as you like and could be used to track holidays and school dates etc… You could hand on your kitchen wall, or add to your planner, the choice is yours! These 2 printables are simple, one page pdf files that you can download and print off as many times as you like. Use to track the date, or countdown to a specific date – simply cross off the days as you go through the year…. I love the plain black and white design, as always – because it means you can keep it very simple and classic and add in colour as you want, but this year I decided to add in an extra colouring in version for you to use too…. Colouring in is a favourite way to spend a few spare minutes for me, and a great de-stresser (always a bonus!) – and when I asked you recently about whether you enjoyed it as well, it was a huge YES! As such, I couldn’t not add a colouring in version to the free printables library now, could I?! It actually looks great when just left in black and white, but feel free to doodle and colour as you want. It would also make a great craft project for the kids! I really hope you like this addition! This printable 2019 calendars are available in the OMH Printables Library – the place where all free printables from the site are kept. It’s available for newsletter subscribers as a special freebie, and all you need to do is enter your email to become a member and get instant access. Hope you enjoy! Do you find having a year planner helps keep you more organised? I’d love to know how you are thinking about using it, so please leave a comment below – thanks in advance! P.S. Don’t forget – I have lots of other printables and planners available for 2019 right now in my shop, including a 2019 diary planner – just take a look by clicking HERE – I hope you love what you find! Previous Post: « HOW TO CLEAN WINDOWS WITHOUT STREAKS – EASY TIPS & TRICKS! So pleased it’s useful Jennifer!